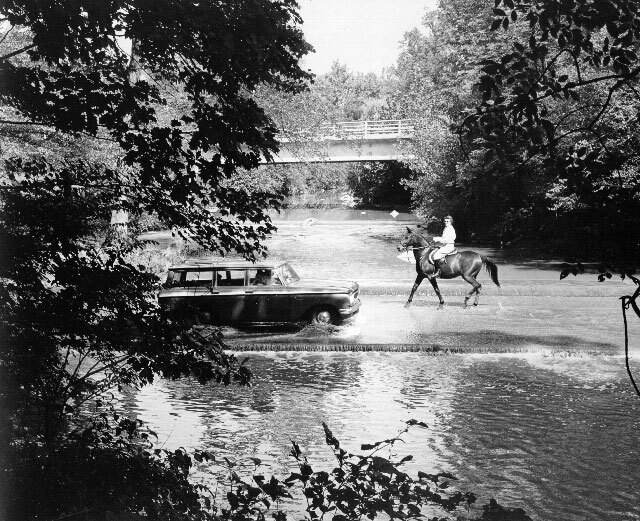 Cheap thrill: crossing the ford through Rock Creek in 1960. When my family moved from Pennsylvania to Northern Virginia in the early 1950s we lived for a while in a small motel on Arlington Boulevard, near Fort Myer, while my parents looked for a house. We were within Frisbee range of the Nation’s Capitol. Of course we didn’t have one back then. Flying discs were still a new West Coast idea and hadn’t yet evolved to become a lifestyle. However my Dad was enthusiastic about the educational and cultural opportunities that would be ours living near the Big City. And in time, we did learn a lot as we explored D.C., Alexandria, and points west. We went to the Smithsonian regularly. We heard free concerts by military orchestras on the steps above the Potomac River. But most memorable of all, we went often to the National Zoo. To do so at that time, we traveled by way of Rock Creek Parkway, fording the creek just before we got to the zoo. We drove our 1954 Ford station wagon right through the water. This, from a child’s viewpoint, was real adventure. That ford across the creek is no longer an option for today’s zoo visitors. Times change and with them the roads we travel. When we first settled in Northern Virginia there was no beltway. Route 66 hadn’t razed its way through the heart of old Falls Church and Arlington. There were still a few cow pastures and horse barns at the small intersection known as Tyson’s Corner. There was no Roosevelt Bridge, etc. etc. So, yeah, I must be old. But the beauty of old, if you’re lucky enough to get there with a few brain cells intact, is the perspective. I still love the zoo. In some ways it’s better than ever. It has all kinds of support organizations and activities for all ages. There are pandas now. All they had were regular bears when I was a kid. They have free-ranging orangutans and fabulous new elephant facilities. Right now, for the holiday season, they have ZooLights, a great way to spend time in the cold and dark with your kids, or just to release your inner child. But you can’t drive your car through a stream to get there anymore. And you’ll have to pay to park.